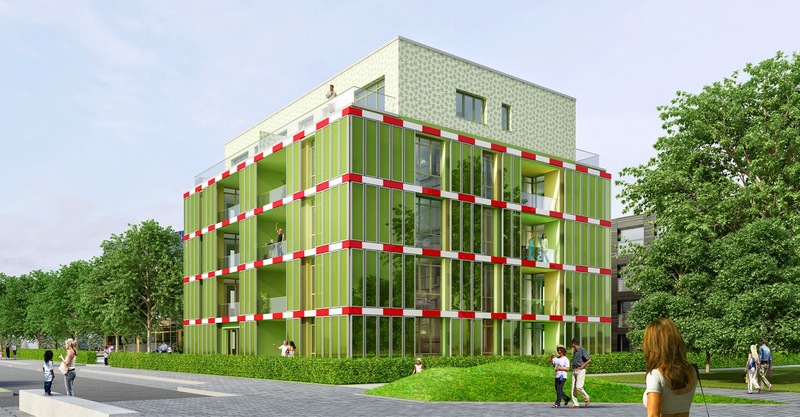 Hamburg, Germany - The 15 unit Bio intelligent Quotient (BIQ) House, part of the 2013 International Building Exhibition, was built to test the world's first "bio-adaptive" facade, which uses micro-algae to shade the building as well as generate energy, designed by Arup, SSC Strategic Science Consultants and Splitterwerk Architects. As the world's first building powered by algae, the facade's bioreactors use photosynthesis to grow the algae, which is then harvested and converted to biomass for energy generation. 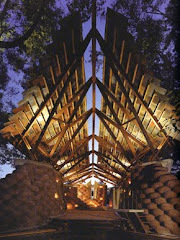 This process for generating sustainable, renewable energy creates a shimmering, dynamic green facade for the building. 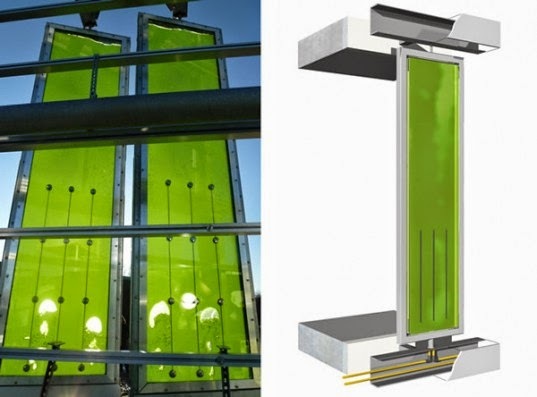 The micro-algae, about the size of bacteria, are generated in reactor panels that are supplied with nutrients and carbon dioxide in order to grow. These panels are the secondary skin of the building envelope covering 2,150 square feet of the southeast and southwest facades. The BIQ house has a holistic approach to its energy concept. 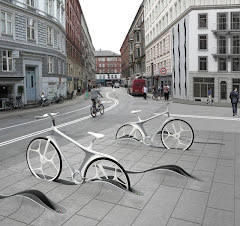 It captures all the energy needed to generate its electricity and heat from the sun, leaving fossil fuels untouched. The facade includes 129 bioreactors, which help to insulate the building and keep out noise. The height of the algae can be changed to help with daylighting or provide shading from direct sun. Each reactor is controlled by an energy management center which harvests the algae and solar thermal heat as well as turns the reactors towards the sun. Excess heat from the sun, unused by the algae, is either used directly for solar hot water or stored in tanks under the building for later use. 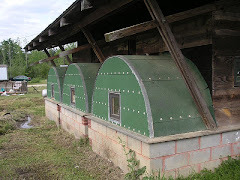 When the algae hits a certain rate of growth, some of the algae is harvested and taken into the building for processing, where the biomass is converted into biogas which can be burned to provide heat in the winter and electricity. The carbon dioxide from burning the biogas is then used to feed the algae. Jan Wurm, Arup’s Europe Research Leader, said: ‘Using bio-chemical processes in the facade of a building to create shade and energy is a really innovative concept. The news comes after Arup announced their vision for the future of skyscrapers which suggested that buildings would be ‘living’ buildings powered by algae that respond automatically to the weather and the changing needs of inhabitants. An experienced architect can help adding strength and beauty to a building, and that’s what a common man like me can demand while constructing a new home or renovating the old one. Interesting project! House builders should be this innovative.